Virginia experiences various climates and growing conditions. While the eastern and southern parts of the state experience a humid subtropical climate, the western region offers a humid continental climate. Virginia falls within United States Department of Agriculture (USDA) Hardiness Zones 5 to 8. Virginia gardeners should select shrubs according to intended use, mature size, appropriate zone and bloom time. Various shrub varieties perform well in Virginia gardens. The staghorn sumac (Rhus typhina), a hardy shrub in the Anacardiaceae family, earned its name because of the red-brown hairs that grow on the young branches. This plant reaches between 15 and 25 feet in height with slightly larger spreads. Small, green-yellow blooms appear in June and July, followed by deep red fruit on female shrubs. The green leaves turn various red, orange and yellow tones in the fall. The staghorn sumac grows best in well-drained soils that receive at least partial sun and sometimes suffers from cankers, blister and rusts. Virginia gardeners often plant staghorn sumac shrubs in informal gardens, naturalized areas and wildflower gardens. The northern bayberry (Myrica pensylvanica), a shrub belonging to the Myricaceae plant family, thrives in moist, sandy or peaty soils across northern and western Virginia. This rounded shrub reaches from 5 to 10 feet in both height and spread. The yellow-green flowers bloom in May, followed by gray-white fruit clusters on pollinated female plants. The fragrant bayberries are often used to make soaps and candles. This plant prefers dryer soils in partially to fully shady locations. The northern bayberry works well when mass planted in borders, herb gardens and woodland gardens. The dwarf fothergilla (Fothergilla gardenii), a medium shrub in the Hamamelidaceae family, displays spikes of fragrant white flowers in April and May. The bluish-green foliage turns red, yellow and orange shades in the autumn. The dwarf fothergilla forms mounds ranging from 2 to 3 feet in both height and spread. This shrub thrives in moist, acidic soils that receive full sun. Virginia gardeners often plant dwarf fothergilla in foundations and borders. The tatarian dogwood (Cornus alba) reaches 4 to 7 feet in height with spreads ranging from 3 to 5 feet. 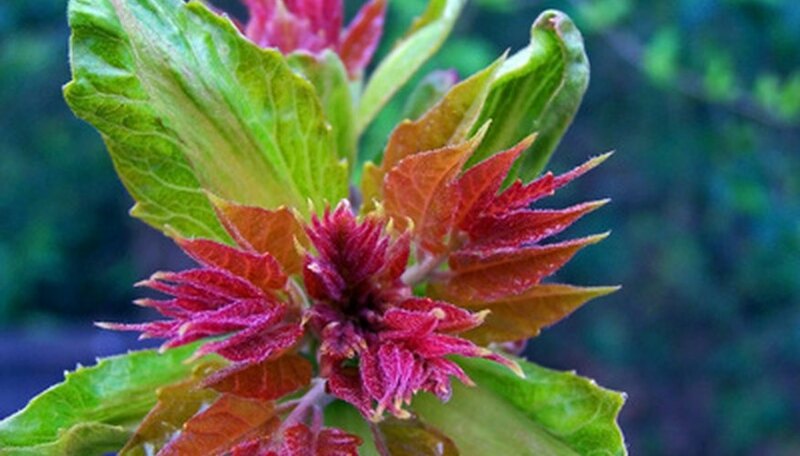 This dogwood variety features red stems and green leaves that turn red or purple in the autumn. Clusters of small, yellow flowers appear in May and June, followed by blue and white fruit that attracts birds. Tatarian dogwoods prefer moist, rich soils in fully to partly sunny locations. Japanese beetles sometimes infest this dogwood variety. Virginia gardeners use this shrub as screens, borders and hedges. The sweet pepperbush (Clethra alnifolia) naturally occurs in eastern North America and performs well in Virginia gardens. This shrub reaches 3 to 8 feet in height and 4 to 6 feet in width. Strongly fragrant, white blossoms appear on long flower spikes in July and August. These flowers are followed by brown seed pods that add ornamental interest to winter landscapes. The deep green leaves turn yellow in the fall. The sweet pepperbush tolerates various soil, lighting and moisture conditions. This shrub works well in butterfly gardens, borders and water gardens.